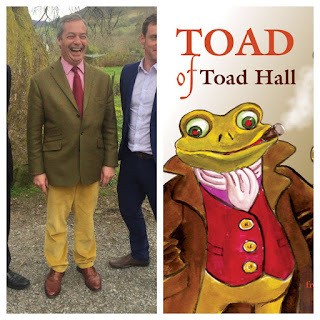 "Mr Farage is expected at the Palace in the next twenty minutes to kiss the Queens' hand and accept appointment as Prime Minister... Afterwards, he and his likely Deputy Prime Minister, his coalition partner and leader of the UKIP, Gerard Batten will meet with their MPs to begin the process of forming a new government. The Brexit Party's Foreign Affairs spokesman, Katie Hopkins, has announced that the new PM has already spoken by skype to President Le Pen, herself a recent newcomer to office, to discuss their planned Budapest Compact for a New Europe. Viktor Orban of Hungary and Matteo Salvini of Italy are expected to join them as they prepare to radically overhaul the European Union into their planned Europe of the Nations confederation..."
Hard to believe, he thought, but it was there. Staring us in the eyes. In the f*cking face, in fact. But of course, just as they'd never anticipated it, the liberals even now denied it. Someone must have stuffed the ballot boxes. The media told lies. 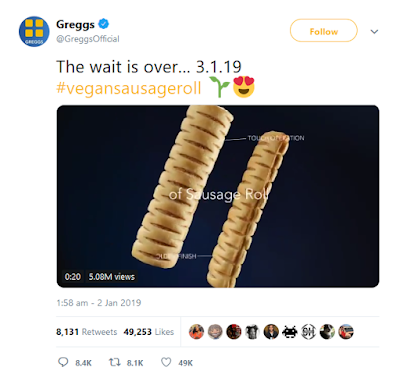 The great unwashed had fallen for the Facebook ads and the Twitter memes yet again. Didn't they see it...?? But this was one vote they couldn't rerun and a process they couldn't drag out. Sure, they had won the second referendum. Back in September 2019, the ChUKs champagne corks had popped and the Lib Dems shook in exotic spresms when, pushed from pillar to post, Theresa May had caved in and agreed a second referendum. Her deal, her precious deal, or... Remain. "No deal" wasn't an option because it apparently made no sense. "Anyone who wants to vote for that, is too stupid to be allowed to vote!" declared one Nu-Labour peer as the ballot bill was rushed through a somnolent Lords. And so they won: Remain on 54% of the vote carried the day. After 6 weeks of ever more vicious and divisive argument, somehow even worse than the first plebiscite, 16.9 million backed staying in the EU. Article 50 was revoked and, tail between its legs, Britain sheepishly returned to the Eurofold. Bereft of her majority already and with Rees-Mogg's ERGers in open, permanent revolt, Theresa May retired to a wheatfield in the Home Counties. A National Government under Sajid Javid was forged between the rump of 220 Tory loyalists and the ChangeUK contingent, now swollen to 80 as Blairites fled the Labour Party en mass. The SNP provided "confidence and supply" in return for its own second indy referendum being agreed for 2025, ten years after the first. No one could remember when the term zombie parliament first entered common parlance. It was probably before the referendum, but at any rate by early 2020 it was seared in permanent place. In the crumbling gothic ruins of Westminster, the patchwork of neoliberals and chancers kept things turning a little bit less each day. But outside, something was happening. The Brexiteers had lost the referendum. 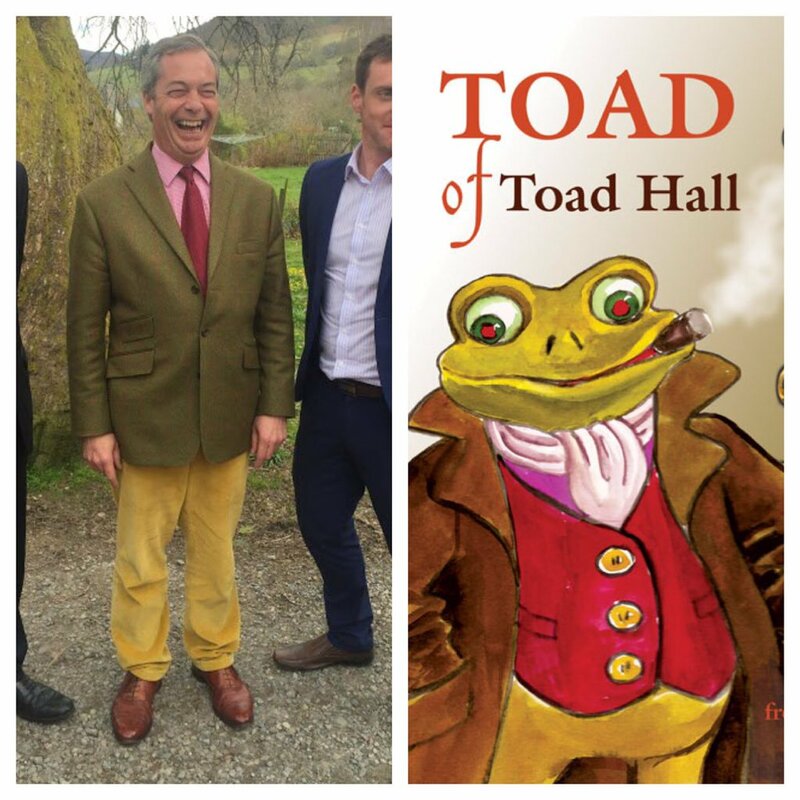 But amidst sarcastic jokes of "best of three", and the seething anger of millions of Leavers, Squire Farage donned his finest tweeds and, harrumphing like a latter day Toad, proclaimed war on the Weasels of Westminster. And just as the SNP had hoovered up the YES vote after they lost the Scottish referendum in 2014, so the Brexit Party and, to a lesser degree, UKIP, found their stock rising in spite of the referendum result. Or, as he pondered things now, perhaps because of it. For people who had switched back to the Tories and Labour in 2017 after both pledged to honour the first referendum turned away again. The shenanigans that had stretched all the way through 2019 had poisoned most citizens' views of the political system. The self-identifying Political Class never seemed so detached from reality as it did that year and, feeling no loyalty from their MPs, similarly millions of voters offered none in return. In early 2021, the formal defection of 40 ERG MPs from the Tories to Farage gave the new Brexit Party, by then in a pragmatic alliance with UKIP, a significant parliamentary presence for the first time. By late 2021, the rightwing collaborators stood at 29% in the polls, behind Labour's 32% but 12% clear of the Change UK party and 14% ahead of Javid's doomed Tories. The General Election campaign of spring 2022 was bitter. The Leaders' debate between Javid, Farage and Corbyn oused with recriminations and accusations of treason, racism and corruption. Farage and Corbyn were seen as joint winners by the polls, with Javid sinking. But still, on polling day, Labour clung to a 3% lead - 35 to 32 - over the Faragists. The received wisdom was that as UKIP had polled 14% in 2015 but won no MPs, then even with a much swollen vote, they might hope at best for "a Brexit dozen" as Ken Clarke scathingly predicted from behind a large cigar. "Farage finished" proclaimed the Guardian, while the Independent favoured "Brexit's Last Gasp" and even The Sun cautioned "Nigel Nowhere?". Polling was brisk, but in Leave-voting areas from the referenda, it was mobbed. Angry queues formed from early morning as Britain enjoyed the first days of a warm summer. Police fought with groups of right wingers who moved through London parks attacking black people, tourists and anyone - indeed, anything - they deemed foreign. He spat as he remembered sitting with some Green and Lib Dem friends in a tapas bar in Limehouse. They had all been in high spirits as they traded tales of ignorant Brexit supporters on the doorsteps. As the sonorous election programme theme sounded and the red and blur graphics sparked and sparkled in the dim light of dusk, they had watched in jubilant anticipation. "And our prediction is - Brexit-UKIP take 35% of the national vote and win with 312 MPs for the BP and 36 for UKIP. An overall majority for the alliance of 46 seats. Labour remain the official Opposition with 201 and the SNP follow up with a much increased 49. The Tories polled 19% of the vote, better than expected, but held on to just 19 seats..."
"First-past-the-post," he heard himself mutter. "First-past-the-f*cking-post..."
They somehow hadn't reckoned on that, had they. 46% of the vote lost the Brexiteers the referendum; but just 35% won them an outright majority in the Commons, as it had done for Blair way back in 2005. 65% opposed them, but there was Farage in Downing Street and Tommy Robinson on his way to his new desk at the Home Office. But of course, at least Britain was still in the EU. That would protect them, wouldn't it? As he sat now on the side of the raft on this grey day, his gaze switching from the lapping water to the distant Gallic shore, its haze-covered beaches traced with barbed wire and lookout towers, he knew better. The distant hum grew louder and through the faint mist he watched the Border Protection Force frigate HMS Enoch Powell bearing down on the flotsam and jetsam of liberalism as it bobbed in the cold waters around him. He closed his eyes. And as the guns strafed the sea, he grew angry, his face contorting with pain. Yet it was not from piercing bullets that his agony came, but from his seething disappointment. 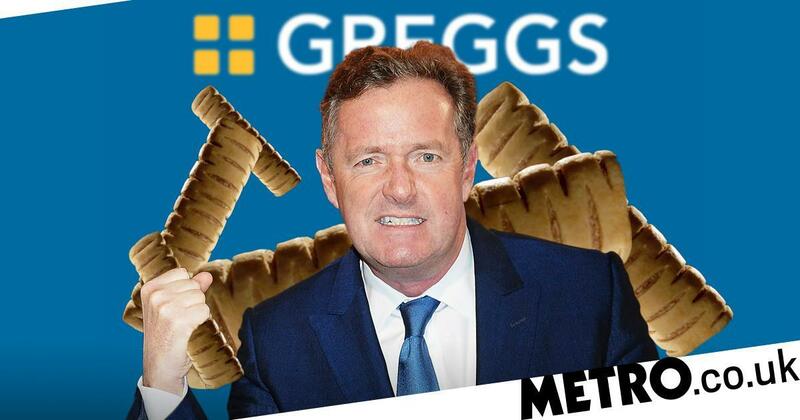 For in these, his final fleeting seconds, all he could think of, all that he could visualise, was David Cameron, his porcine chops grinning and puffing pretentiously, his condom-quiff wobbling and his porcelain-perfect teeth flashing with customary contempt. The news that the Royal Navy is to hold a National Service of Thanksgiving for Britain's nuclear weapons on 3 May has to be an almost unique event and one rightly condemned by the Campaign for Nuclear Disarmament, which is running a petition to call for it to be cancelled. It is one thing to commemorate the sacrifice of the armed services in past conflicts - Remembrance Day offers reflection of the loss of the dead and the chance to engender hope for future peace. Above all else, it is about people, the flesh and blood and spirit that makes us human and that was either threatened, damaged or destroyed in war. The Alpha & Omega: the Ape Doomsday Bomb! 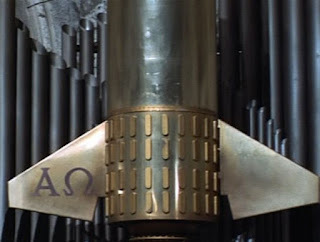 This ceremony, however, is to give thanks for our possession of weapons systems - Polaris, Trident and the future Continuous At Sea Deterrent replacement (cost £205 billions). Not just any weapons systems of course - systems of Mass Destruction: many, many times more powerful than the puny atomic bombs that devastated Hiroshima and Nagasaki, Westminster Abbey will see God thanked for our supposedly independent nuclear force (which can't actually be used without US targeting systems and service facilities) which has the capacity to completely destroy the world and all life on it. This is at best misguided; at worst, it is an ominous development, incorporating militarism and nationalism into a religious ceremony. Shades of a dark future - after all, our Secretary of State for Defence Gavin Williamson apparently dreams of a post-Brexit world where British armed services use our "hard power" to face off against Russia and China. Delusional fantasy for sure, but all the more dangerous in a mindset that seeks to bestow some sort of halo on a ballistic missile system and presumably sanctifies its use. This is, for a change, a personal piece - I rarely write here in the first person or about my own life or experiences, but today I make a possibly self-indulgent exception. Because this week, for the first time since either May 1977 or possibly 1978 - it's a while ago either way! - I am not a member of a political party, a state that, after all these years, seems mildly odd (when in truth, set against the population as a whole, it is membership of a party that is odd - fewer than one in ten people join one in their entire lifetimes). After nearly 14 years, I have said goodbye to the Green Party of England & Wales. It may seem to some of my former colleagues and comrades a strange time to take such a step - after all, when have politics been as fascinatingly volatile as this frenetic week of Brexititis at Westminster? A hung Parliament has figuratively hung a Prime Minister, hoist on her own hubris and peculiar school-prefect-like mix of duty and disdain for lesser mortals. And of course the Opposition is little better - fracturing parties, policy changes by the day, while Brexiteers warn ominously of treason and Remainers of apocalypse. An election could be weeks away, or a referendum - or just a meltdown. Great days for active politicos of any and all stripes in any and all capacities. And as historic days pass by and our electorate scan the horizon for some hope, this could have been the time for Greens to have offered a new way forward - while still open to the world we care so much about, we could have been majoring on our core policies of fostering local economies and bringing manufacturing closer to home to create a fairer, more sustainable way of doing things. But instead we have been enthusiastically adding to the centrist narrative of almost any form of Brexit being the reality version of The Walking Dead. I voted and campaigned for Remain, but the Greens' drive for a second vote from as soon as the results of the first one were declared completely ignored the reasons for the Leave victory - and fails to consider the possibly dire consequences to our politics if a second vote reversed the first by anything less than an overwhelming margin, something no polling evidence suggests even remotely likely. What better shot in the arm to Farage's Brexit Party than if say 47% still voted Leave and, as the centrists popped open the post-referendum champagne, his new party scooped up even just 35% of the vote at the next General Election? That same figure gave Tony Blair an outright majority in 2005. But it is not only in Brexit that strange days have fallen on the Greens. After a record-breaking vote in 2015 under Natalie Bennett and a second-best ever result in 2017 in spite of fewer candidates and the Corbyn surge, a narrative took hold across the national echelons of the party that, in truth, these two amazing results were actually abject failures caused by the promotion of a far-left, almost bolshevist agenda. Apparently, there had been too much emphasis on the NHS, on renationalising the railways and energy sectors and tackling inequality. Time to turn back to talking simply about ecology and climate change - so now the strategy passed by the party last spring commits it to a path described in the document as "social liberalism". What is "social liberalism"? Well, aside from it being the title of a vaguely social democratic group within the Lib Dems, it is usually used to describe a combination of mildly regulated free market economics with promotion of individual freedom. 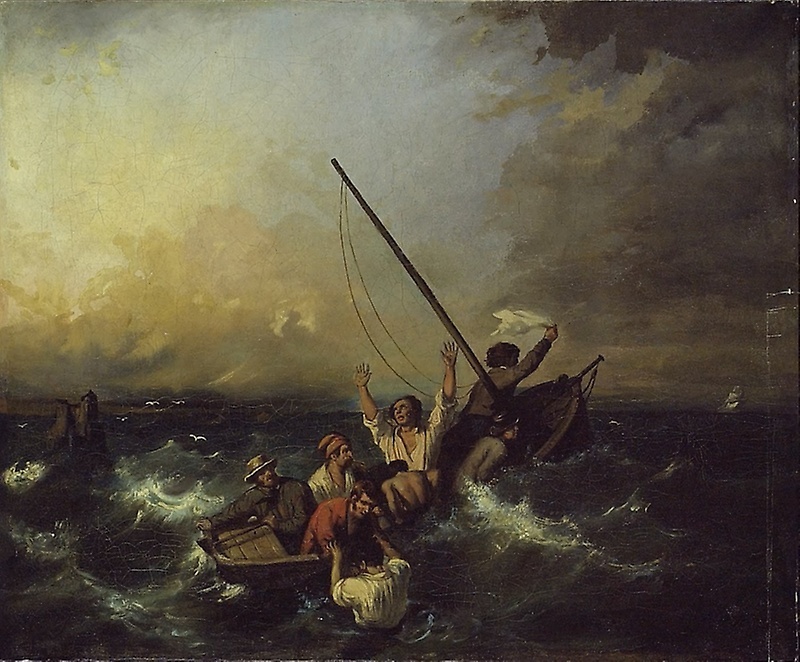 While it sees the role of government including ameliorating poverty and providing some level of social support, it does not fundamentally change capitalist economics nor challenge ownership of resources or concentration of wealth - at its heart is a policy of growth and managed/ prompted trickle down of wealth, a sort of kinder, gentler neoliberalism. How would ot could this ever provide the social and economic transformations needed so urgently to stop environmental catastrophe? This is quite a contrast to the party I joined after hearing Caroline Lucas argue passionately on a panel about economic and social justice and about the ills of capitalism in 2005. It is a peculiar path to take and unnecessarily exclusionary for those of us who hold to ecosocialism or simply to breaking up capitalist monopolies to create new forms of economics focused on sustainable sharing of resources. The rest of the strategy explains why - social liberalism hopefully appeals to some voters from other parties, crucially including the apparent abundance of green-minded Tories who would have voted Green if only we hadn't been calling for a public NHS or for a fairer distribution of wealth. So, sure, if you represent a party as a candidate, as I have done at local and parliamentary level, you need to be at least comfortable with what it is doing - though would the words "social liberalism" either win over or deter anyone on the doorsteps? Or for that matter, the party's current decision to abolish its formal trade union links? Nope, of course not. It is a case of activist-world problems, dear perhaps to me and others who fuss over such matters, but how crucial really in the wider scheme of things when our planet is burning up, literally, before our eyes? Well, humans are social creatures. We affiliate to many communities and groups. Our friends, colleagues and comrades are our tribe. Like families, we might fall out, but in the end, we make up. Or do we? British politics and society, just like pretty much everywhere else now, are divided and fractious beyond belief. The Greens are no exception. I won't dwell over-much or break confidences here, but in 2017 I was co-chair of the Green Party Regional Council for 8 months. This is one of two bodies - the other being the Party Executive - that oversee the party's functioning. For me, previously working in my naivete with fairly harmonious and certainly positive, friendly local and regional parties, it was an unwelcome revelation: GPEW has a significant hinterland of caustic complaint, legal threats and mean-spirited, personalised dispute utterly astonishing in a party that claims - in the vast majority of cases, I believe, genuinely - to seek a better, happier world for all. These disputes covered all manner of issues, many at core quite trivial until fermented in sometimes truly alarming vitriol. One repeating theme, mostly after my time on GPRC ended has been around transgender issues. There is certainly discussion to be had for many to understand transgender issues better - and there has also at times been some pretty harsh and inappropriate behaviour by individual transmen and transwomen in the party. But when have Greens of all people held that the actions of an individual justify pre-determined views of a whole group? And if some statements by some transactivists invite questions from others, why can't these questions be advanced in a culture of inquisitive acceptance as opposed to rejectionist hostility? Those who complain about transactivists being overly hostile to others' viewpoints ignore the fact that these viewpoints often deny the validity of transmen and transwomen's identities, for some reason often presuming them to be lightly worn. Not rarely are these complaints themselves delivered with pretty full-on anger. Referencing the worst of US Republicans, sometimes lewd and often bizarre concerns are raised about men supposedly using women's toilets or the apparent indoctrination of children to transgenderism at school - how Clause 28 is that? It seems the history of fighting oppression has been somewhat set aside by some when it comes to transgender rights. For me this came to a head with the posting on a party noticeboard of a lengthy diatribe in the form of a pantomime script filled with crude references to transpeople in the name of supposedly supporting feminism. 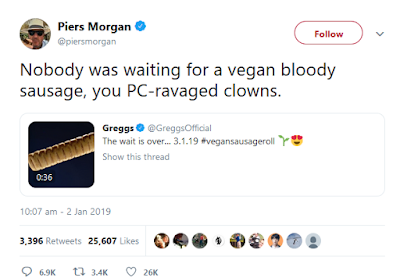 Though written by a woman, it was posted by a man who described it as "hilarious" - sure, very funny if you like lots of references to f*cks and d*cks, but hardly conducive to either inviting serious discussion or fostering a culture of respect. It remained posted for several days, a veritable paean to a new sectarianism. At the end of my time on GPRC, I organised some interviews for the chair of a commission the party conference had voted to set up to review its workings. An interviewee asked the panel what success would look like. A senior party member responded that, among other things, it would be good if Greens were kinder to each other. So, my former Green colleagues, I hope you can learn not just to be kinder but even to love each other again. However, you will only succeed if you acquire that generosity of spirit where, even if you truly can't agree or understand, you can at least accept one another for who you are. Enquire, seek to understand, but no more exclusion, no more pejorative complaints forms or abusive social media tirades. Because after this warmest of winters, as you well know, the world doesn't have the time any more. "What has happened to the Labour Party is a symptom of the dysfunctional state of British politics - it shows why fundamental change is so badly needed. It is time to build an alternative." Bold words from Chukka Umunna as he announced the departure of himself and six other Labour MPs from the party to sit as the Independent Group. 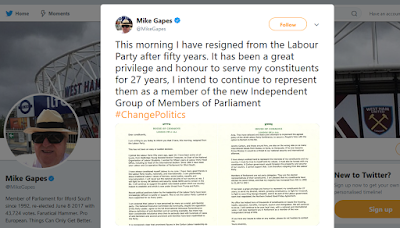 Politics is broken, asserted one of them, the hitherto unheard of Mike Gapes, MP for Ilford South, whose Twitter handle shows him relaxing in his straw hat - perhaps illustrating this whole exercise as a "strawman", hoping to peel off more right wing Labour parliamentarians and members. 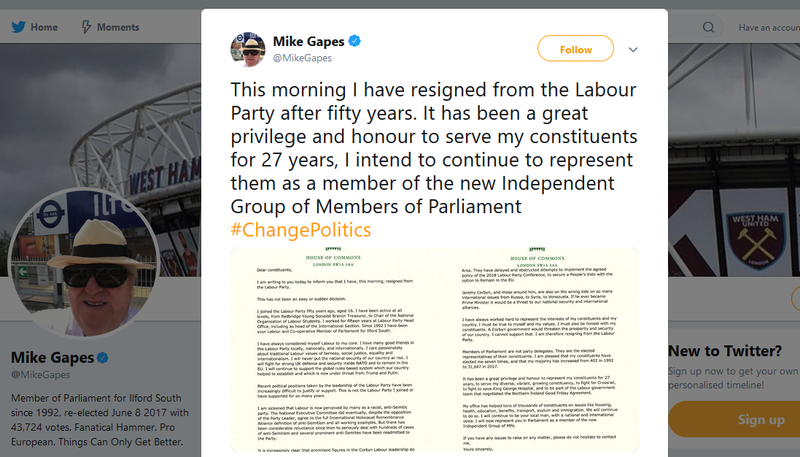 And, it seems, a few Tories too according to Mr Gapes. Bedfellows all. Keeping coy about their intentions about forming a new party, they have set up a website to invite supporters to register. It seems a deliberate echo of the now distant time when social democrats split from Labour to set up the SDP in 1981, for a brief interlude beforehand setting up the Council for Social Democracy. That party briefly flew high before sinking under the ego of its second leader, Dr David Owen, and then vanishing into the merged Liberal Democrats in 1988. But this time, what prospects for the Independents? Well, few could doubt that politics is broken - not only over Brexit (indeed, that is itself a symptom rather than a cause of the current temporal rift in British politics) - but over a society that is broken. And why is it broken? Perhaps it has something to do with the last 40 years of "neoliberalism", the ideology promoted by Thatcher and happily adopted by Blair and his cronies - Umunna and Chris Leslie, another of today's defectors, among them. 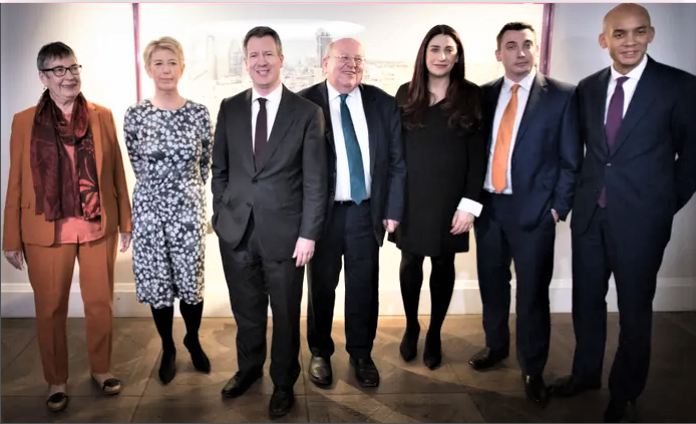 These seven dwarves of centrism - these are the people who happily sold off chunks of the NHS, privatised swathes of welfare, introduced student fees, and leeched out tens of billions in taxpayer funds to ludicrously expensive Public-Private "partnerships", a misonomer of a relationship akin to the type that a tapeworm has with a bowel. These are the people who gladly took us to war in Iraq and blew their own fuses when Miliband and Corbyn opposed bombing Syria. These are the people who were "intensely relaxed" about the filthy rich becoming even dirtier. These are the people on whose watch Britain, the fourth or fifth richest country in the world, became one of the most unequal, a land where the equivalent of the population of a medium sized town sleep in shop doorways and under bridges every night of the year. So they are not the harbingers of a new politics, these Balirite hasbeens and never-weres. 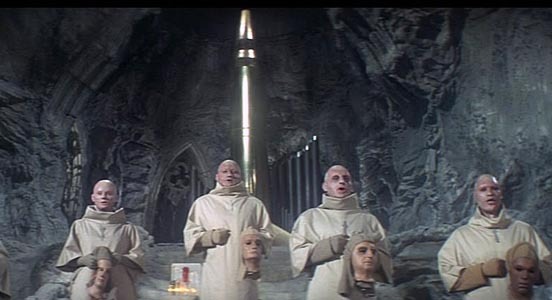 Rather, this little parade of the Usual Suspects this morning seems more like the final spasms of the centrists, akin to a headless chicken still runing around for a frenzied few, final moments. Neoliberalism re-animated, a true Frankenstein for our times. Stitched together, stitched up and, as people turn for new answers to the problems they created, out of ideas and out of time. 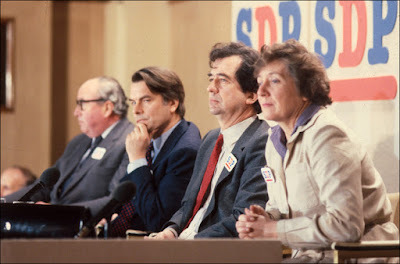 Unlike the Seven Centrists, the SDP only had a gang of four, but at least they had a name: tellingly, Umunna & Co haven't adopted a name - "Independent" is meaningless, though to be fair, "neoliberal" is probably too obscure. So what could they use? The Social Democrats 1981 - at least they had a name!